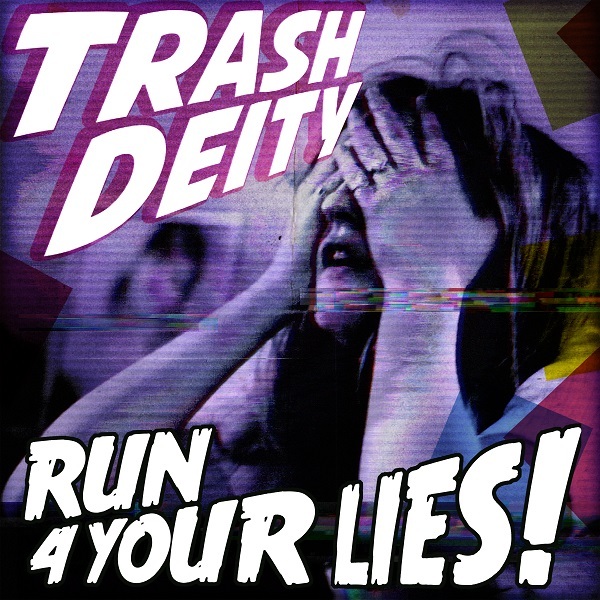 Industrial Rock project Trash Deity, the duo of My Life With The Thrill Kill Kult’s Groovie Mann and Blue Eyed Christ’s John D. Norten, have released the second taste of their upcoming Run 4 Your Lies! album in the form of the single and Official Music Video for the title track. Originally premiered on Paste Magazine, “Run 4 Your Lies!” was directed by Neil Kull. Hailing from Los Angeles with roots in the legendary Chicago Wax Trax!scene comes the new duo Trash Deity. Combining the chaos and energy of the classic Wax Trax! sound updated with hard and modern production, Trash Deity is Groovie Mann aka Franke N. Nardiello (My Life With The Thrill Kill Kultfrontman/writer) and accomplished music producer and industrial artist JDNaka John D. Norten (Blue Eyed Christ). Their debut Single, “Finger on a Trigger”, combines classic Groovie Mann vocals and cryptic lyrics with an infectious heavy electronic/guitar groove benefitting from JDN’s studio experience mixing and engineering major artists. The accompanying Music Video is comprised entirely of manipulated shots of paintings from the twisted imagination and eccentric mind of Groovie Mann. The debut 4 song EP, Run 4 Your Lies!, will follow soon. Nardiello’s informally structured and yet deeply storied career began with his first band, Special Affect, including Marti Sorenson & Harry Rushakoff (Concrete Blonde) with Al Jourgensen (Ministry) on guitar. Shortly after, he moved to London working with Simon Raymonde of Cocteau Twins with post-punk band Drowning Craze recording a John Peel session in 1982. While touring with Ministry in 1986, he met and began working with Buzz McCoy(Marston Daley) to write a film titled Hammerhead Housewife and the Thrill Kill Kult, which was never filmed but ultimately evolved into TKK and an EP released with Wax Trax! Records. Over the next nearly 30 years, Groovie Mann has established his iconic reputation through multiple releases with TKK and contributed songs to several movie soundtracks, even appearing in the 1994 cult classic film The Crow. He’s also established himself as an accomplished painter in the LA art community. His uniquely abstract style offers a further peak into the mind and art of Groovie Mann and are sold to fans around the world.